This text is an invaluable, comprehensive data reference for anyone involved in health physics or radiation safety. This new edition addresses the specific data requirements of health physicists, with data presented in large tables, including the latest NCRP recommendations, which are tabulated and given in both SI and traditional units for ease of use. Although portions of these data can be obtained from various internet sites, many are obscure, difficult to navigate and/or have conflicting information for even the most common data, such as specific gamma ray constants. This new edition compiles all essential data in this vast field into one user-friendly, authoritative source. It also offers a website with full-text search capability. Markets include radiation safety, medical physics and nuclear medicine. Thomas E. Johnson, Brian K. Birky Ph.D.
5. 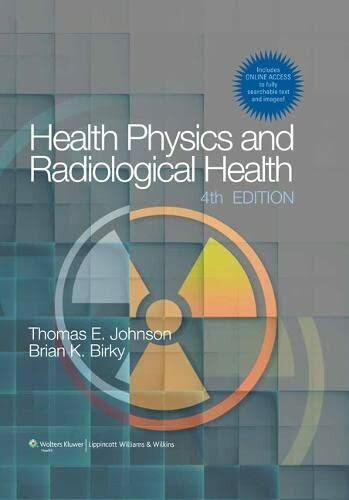 HEALTH PHYSICS & RADIOLOGICAL HEALTH, 4/E (HB2012): JOHNSON T.E. Thomas E. Johnson PhD; Brian K. Birky Ph.D.